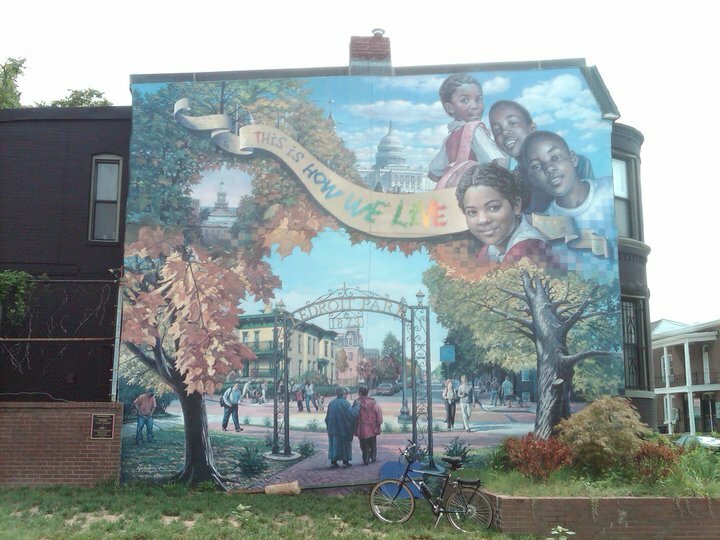 During today’s lunchtime bike ride, as I was riding in the 16th Street Heights neighborhood in northwest D.C., I saw a mural on the side of a building at the corner of 14th and Randolph Streets (MAP). So I rode over to get a closer look. The eclectic nature of the things in the mural indicated to me that there might be a good story behind it. So later I researched the mural. And I was right about there being a story behind it. The mural has undergone several distinct phases to become what I saw today. The mural was originally entitled Washington Pizza, and was located on the side of the Washington Pizza restaurant. 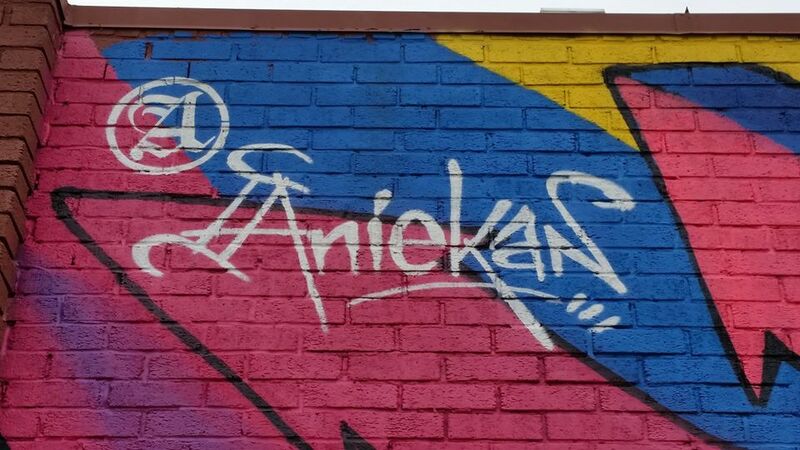 It was created by Alicia Cosnahan, also know professionally as Decoy, a local artist who creates a lot of local graffiti and murals. In its original incarnation it showed a family eating, what looks like a couple of colorized local rowhouses, and an another person eating something. It was topped off by a scrawled and odd-looking no parking warning. Later that same year, on the morning of November 23, “Mayor-for-Life” Marion Barry died. 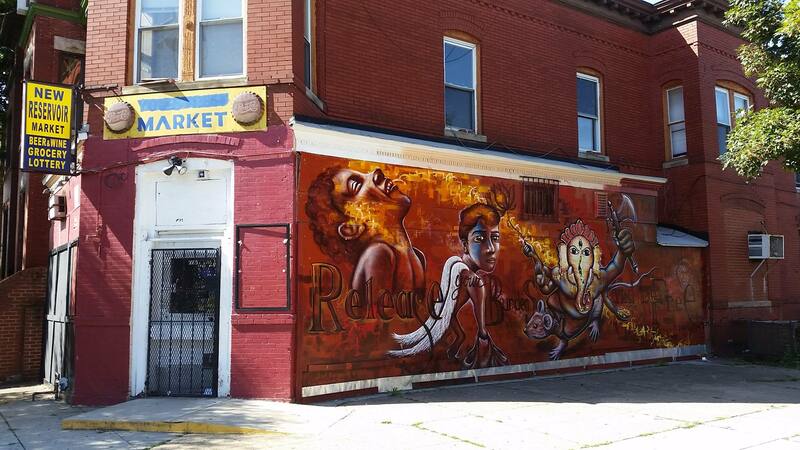 That same afternoon, Head-Roc, along with other local rappers, performed an impromptu musical tribute to Barry at the vacant lot in front of the mural. 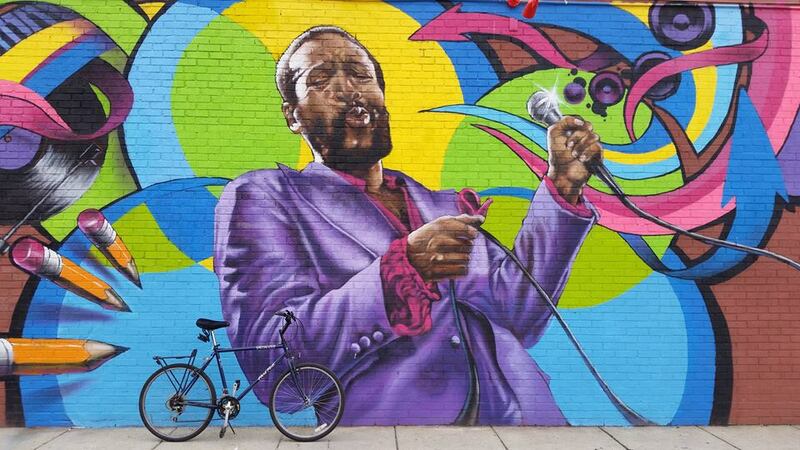 As the music played Pahel Brunis returned and once again modified the mural, this time with a tribute to Barry. It wasn’t planned. He just grabbed what supplies he had at home and showed up. Three hours later he had painted a large portrait of Barry on top of the rowhouses. And that’s how the mural looks today, at least for now. 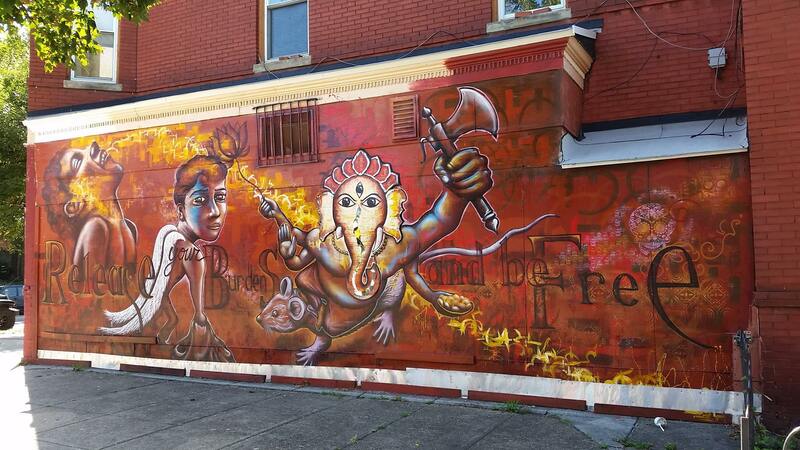 Release Your Burdens and Be Free is located at the southwest corner of 1st and U Streets (MAP), on the side of a building currently housing a corner neighborhood market. It features the Hindu deity Ganesha, the “Remover of Obstacles,” and deals with people’s life obstacles that they create themselves by failing to release their personal baggage. The rest of the symbolism and meaning is up to the viewer to interpret. To me, the meaning of the artwork is similar to the reasons for my lunchtime bike rides, which allow me to temporarily release my burdens and stress, and feel free. 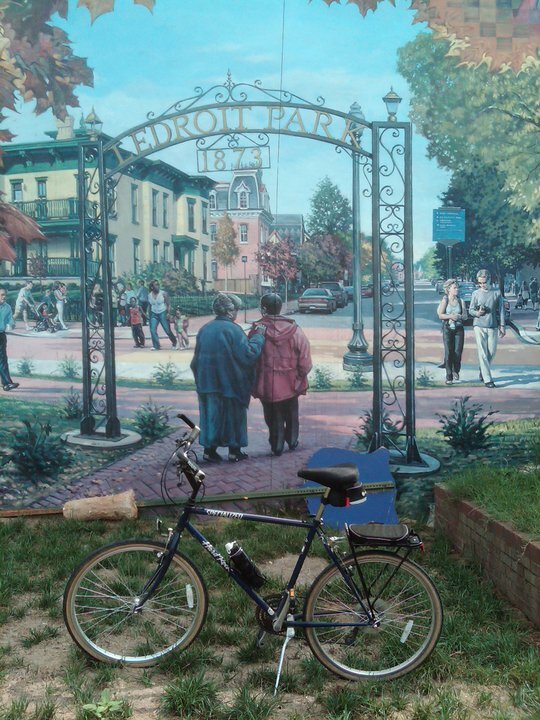 Bergner has created murals and public art pieces throughout the world, including several other murals here in D.C. which I’ve discovered during previous bike rides. 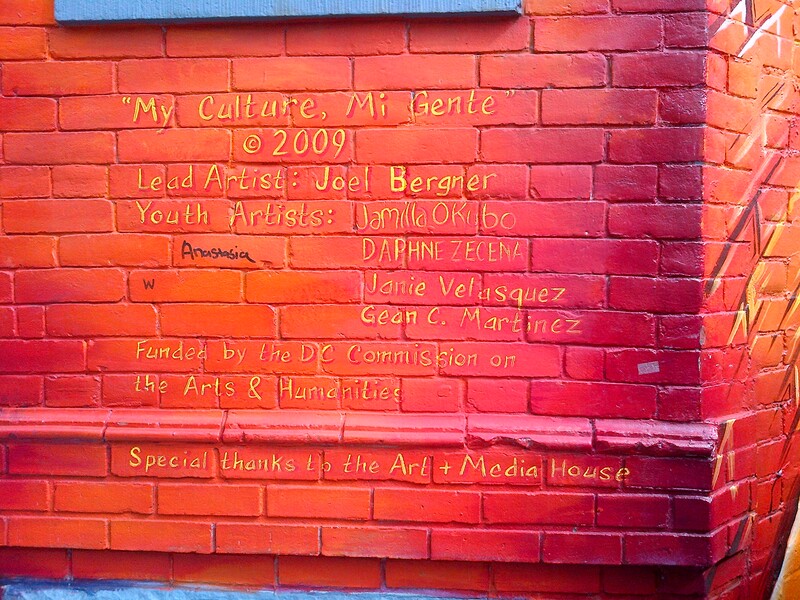 These include Cultivating the Rebirth, My Culture, Mi Gente, and A Survivor’s Journey. I don’t know how many other works he has here in D.C., so I can only hope that I will encounter more of his art on future rides. 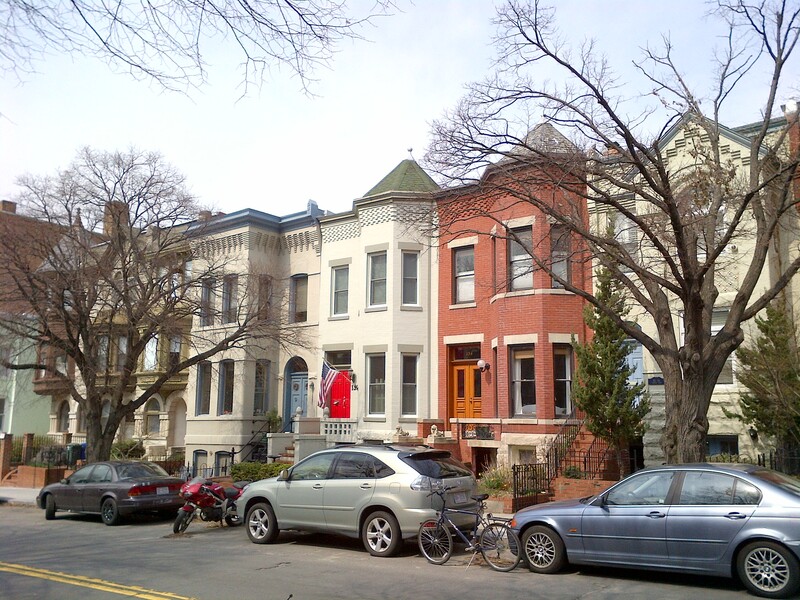 The first photo (above, left) is of row houses in the 100 block of D Street (MAP) in the Capitol Hill neighborhood in southeast D.C. 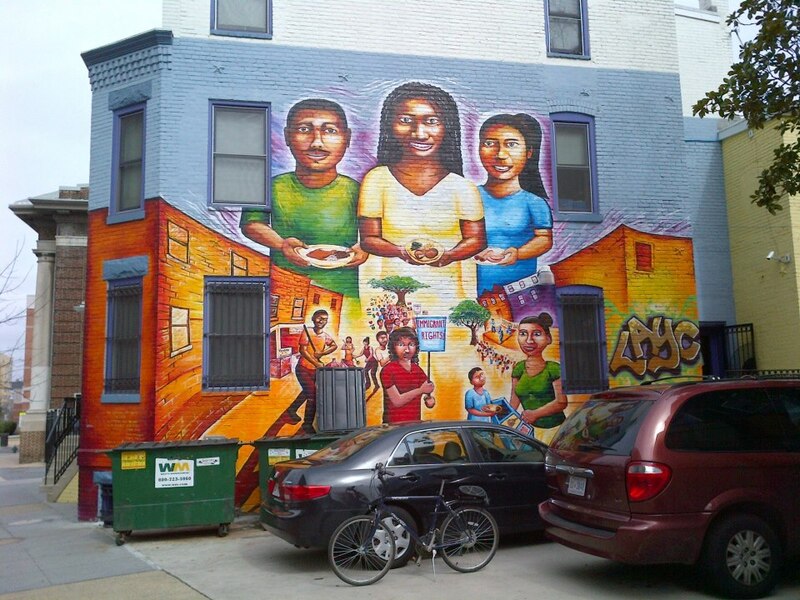 The other photo shows a mural of the same block of row houses. 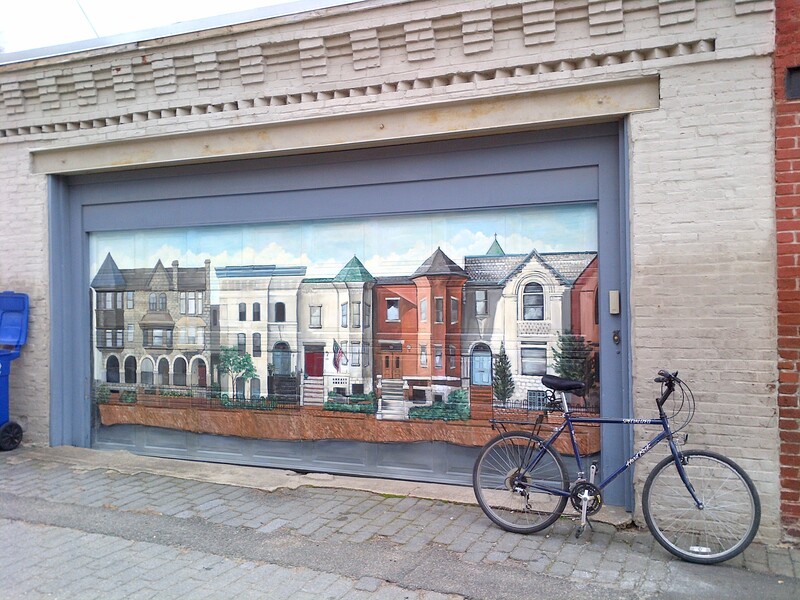 It is located in the alley behind the houses, and is painted on the garage door of one of the houses depicted in the mural. 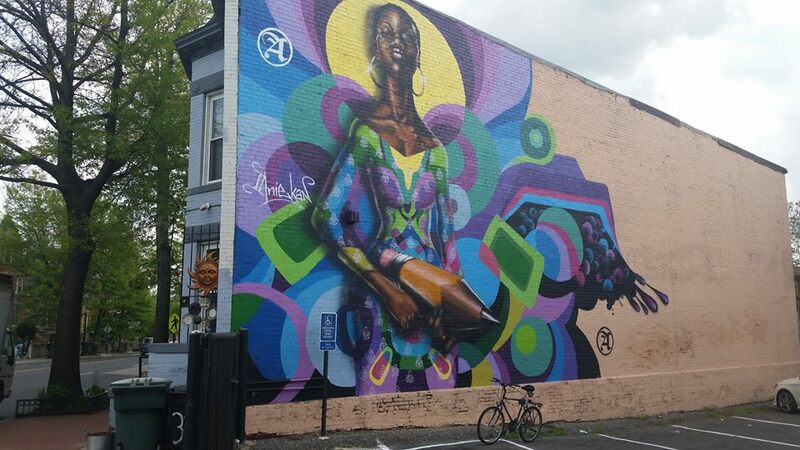 It goes to show that almost anything can be a canvas for an artist with enough imagination, so you just never know where you might find a work of art in D.C.
After discovering this mural, I also discovered a new iTunes app called ArtAround. 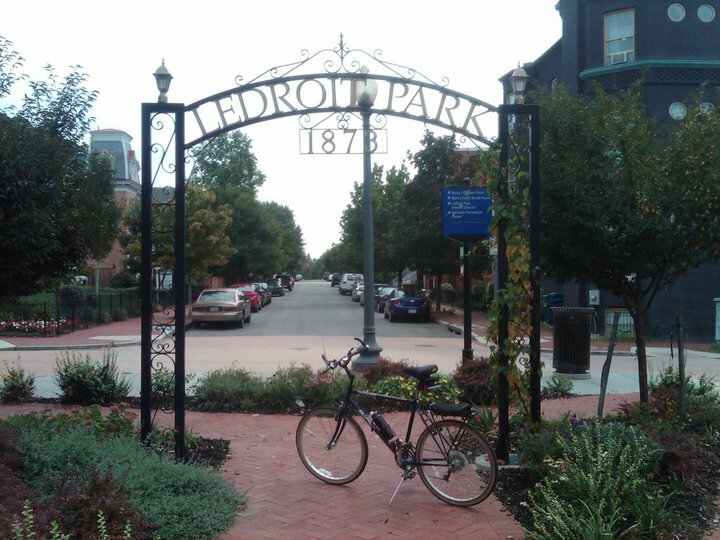 ArtAround started out as a budding social project to map art in D.C., San Francisco, New York, Oakland, and a few other cities. It has since expanded to include the entire United States. 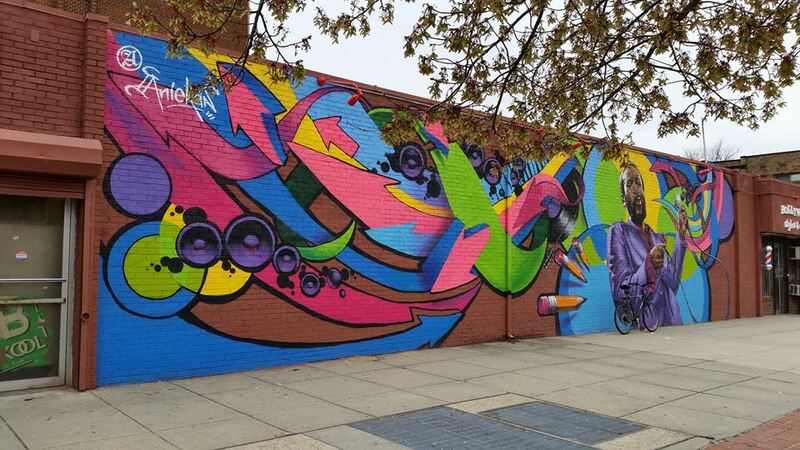 ArtAround helps users find, map and share the “art around” them, creating a community-generated map, tagged with the locations of publically accessible art, including murals, sculptures, and even graffiti. 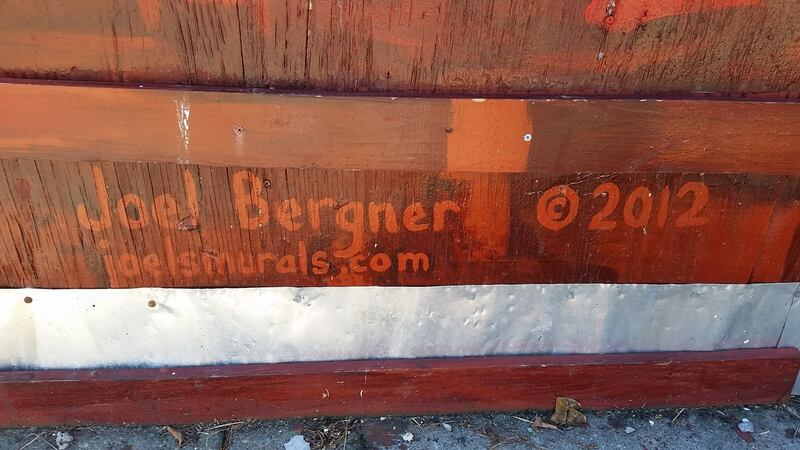 Anyone can photograph the artwork, then upload its location and information to the ArtAround app. Fellow followers are able to explore the map, comment on particular artwork and update information on the piece to include its name, creator and description. 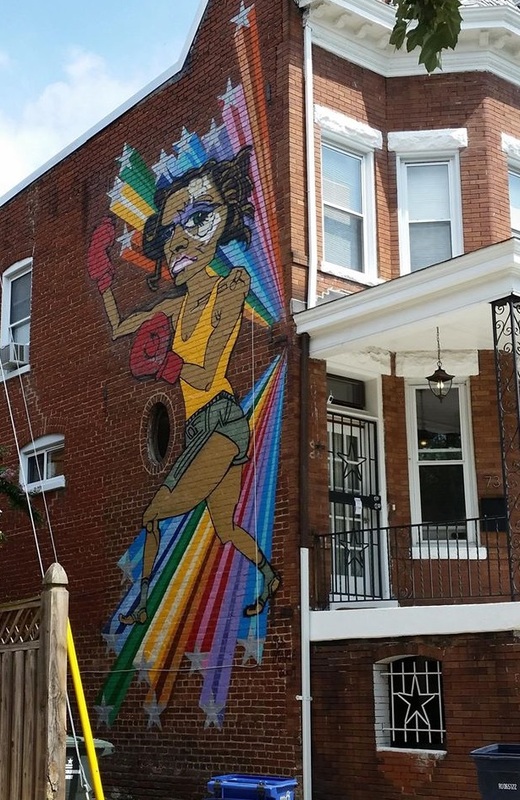 I uploaded this mural to the ArtAround web site, and am hoping to find out more about it through the app. The app’s Executive Director Anna Bloom was inspired by walking throughout and exploring the city of San Francisco where she lives. Much like I do on a bike in D.C. In describing the app, she stated, “I think the idea behind the app was to make those experiences, those deeper connections with art — and by extension, place, history and culture — more ordinary. To make them a part of everyday life.” It is kind of like bringing museums out onto the street, and I’m all for that since most museums won’t let me ride my bike in them.